Categories: Property Management // Tags: commercial construction, commercial real estate, ground up, ground up construction, project management, scott hamele. There are thousands of articles and books written about project management in construction. However, I seldom see much of anything mentioned about choosing the right subcontractors. The construction project could be ground up, tenant finish or even retail renovations; selecting the right subcontractors and vendors can make or break the job. It isn’t always about the almighty dollar. I have been involved with, and continue to work with, some subcontractors that go above and beyond to satisfy the client. On the flip side I have also been involved in numerous construction projects where the subcontractors chosen have slowed the project down, wouldn’t work with other trades, were disrespectful to the owner and would not follow the design documents. What some subs don’t realize is that they are part of a team and one spoke of the wheel. I consider the subs, vendors, general contractor and design professional all on equal ground. The project can’t be delivered successfully if everyone on the team doesn’t do their part to succeed. 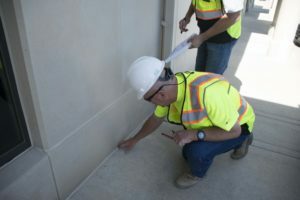 Vetting different subcontractors, based on their size, will greatly ensure the success of a project. Not having enough skilled labor for a specific part of the job can kill a schedule. On the other hand, adding bodies to the labor force can help the overall schedule and enable early delivery of the building. If the subcontractor doesn’t have the skill level to provide the services required, it can be a huge detriment to a project. An electrical contractor may be licensed, but not experienced in a specific field of construction like healthcare or food service. These specific fields require additional knowledge and experience that others may not. All projects should be run with a team approach for all parties involved with the project. A good-natured temperament is a must. A subcontractor that is not willing to work alongside other trades is a liability to the success of a project. There are thousands of tasks and decisions required for successful project management. Choosing the right subcontractors is the most important of all. The subcontractor can make you look good or bad in the end and influence your reputation. Ultimately everyone involved should want the customer to be 100% satisfied with the delivery and investment of their project.